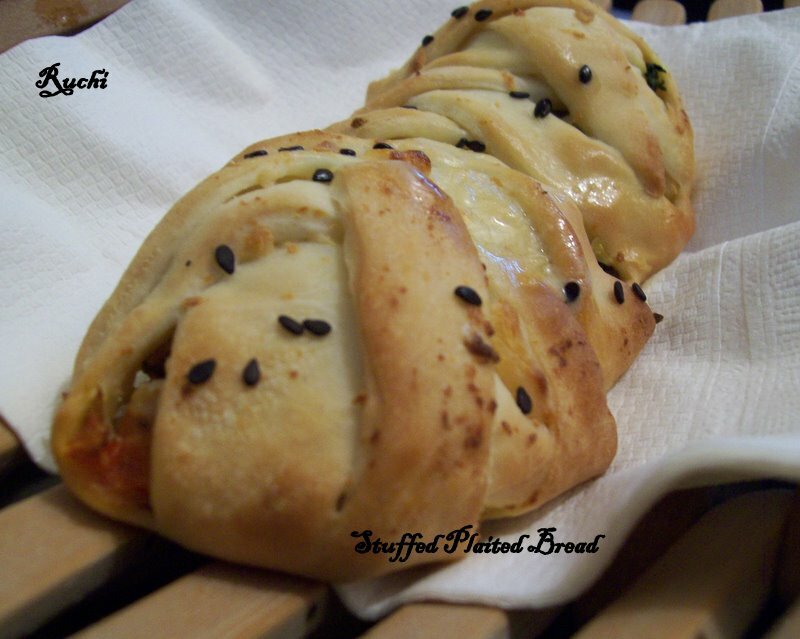 I recently came across a braided bread recipe which captivated my mind; After looking at this beautiful bread in a couple of blogs, I wanted to try one on my own. It is very easy to prepare and very delightful to look and the fillings making the bread more scrumptious. When done, remove from the oven and brush with butter if desired. These can be enjoyed warm and in fact should be enjoyed when warm. They taste great when cold too. The left over’s can be warmed up in the oven and served warm.Mix and match from a couple of recipes.And here comes my version. 1. Heat oil in a pan on medium heat. Add in the cumin,seeds. Let them splutter. 3. Add tomatoes till dry then add the green peas, turmeric, salt and coriander powder and stir for 2 minutes. 4. Add the potatoes and cook for 4 - 5 minutes. Add the red chilli, garam masala. Mix and remove from heat. Allow the mixture cool down to room temperature. Dissolve fresh yeast & sugar in warm mixture of milk & water, mix well, sprinkle a little flour & leave. 1. In a medium bowl mix the yeast, sugar, and milk and set aside in a warm place till it becomes frothy about 10 minutes. Add in the salt and oil. Mix. 2. In a large bowl add both the flours, mix. Make a well at the center and add the yeast mixture little by little. 3. Combine everything using your hand and start kneading. Knead for 5-6 minutes until the dough becomes smooth. 4. Apply oil over the dough and cover with a wet kitchen towel and place it in a warm place. Let the dough rise to double its size, about 1 hour. 5. Gently deflate the dough and knead for a minute. Roll the bread dough to a rectangle 1 cm thick. 7. Spread the filling and cheese on the center one third. Cut 1” wide strips on either side of the filling. 8. Make sure there is the same number of strips on each side of the filling. Leaving the end closest to the filling attached. 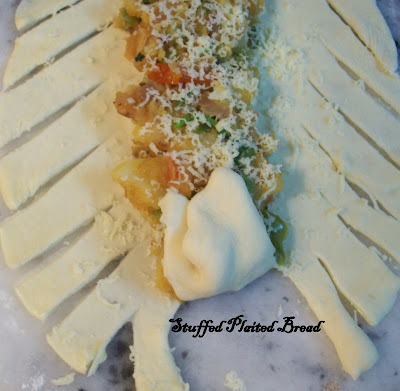 "Braid" the strips up over the filling, tucking in loose ends and wrapping the final piece or two under the bread. Let it rise again, about half an hour. 9. Brush the top with milk & bake at 180 deg for 15 mts or so till top turns golden brown. 10.Serve hot with tomato ketchup. 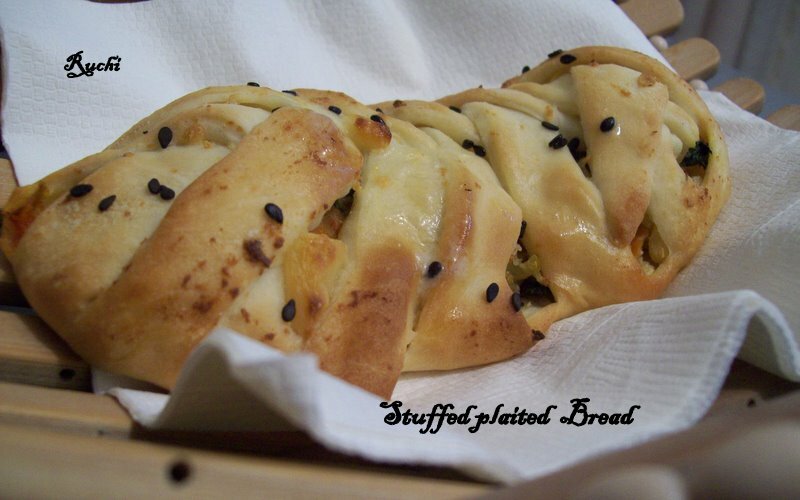 Well done akka, bread looks super delicious with wonderful stuffing.. I too wanted to try this for so long now,looks tempting! Loved this recipe. It looks like a crossiant. Bookmarked. Let me do it sometime. Thanks akka.